On Friday, April 6, 2018, at the College Language Association (CLA) conference, I presented my paper “The Black Anthology Project” on a digital humanities panel. In September 2017, I started working on the Black Anthology Project directed by Professor Kenton Rambsy. The goal of the project is to create a digital record concerning the contents of 100 anthologies, published over several decades. 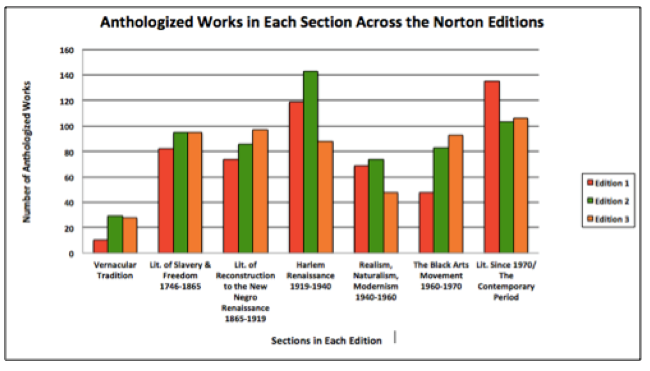 In my presentation, I provided a handout to audience members where I charted some of my findings from my analyses of the three editions of the Norton Anthology of African American Literature (1997, 2003, 2014). These preliminary findings compared the appearances of men and women authors in the editions. 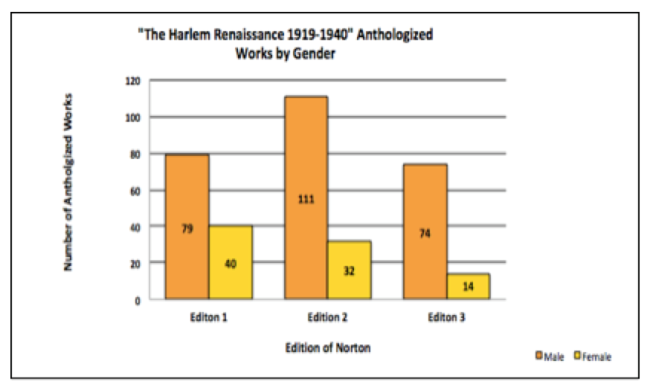 In figure 1.2, I’ve noted that “The Harlem Renaissance” and “The Black Arts Movement” contain relatively fewer literary works written by women authors than men. Works such as “Lady, Lady” by Anne Spencer, “My Little Dreams “ by Georgia Douglass Johnson, and 4 four chapters of Nella Larson’s Quicksand are removed after the first edition. Similarly, in the Black Arts Movement section (Figure 1.3), the number of entries by men writers rises consistently across the three editions from 37 entries to 56 entries. The number of anthologized works by women authors rises from 11 entries in the first edition to 38 entries in the second to fall again to 37 entries in the third edition. Works such as “Railroad Bill, A Conjure Man,” and “Chattanooga” by Ishmael Reed are added after the first edition. 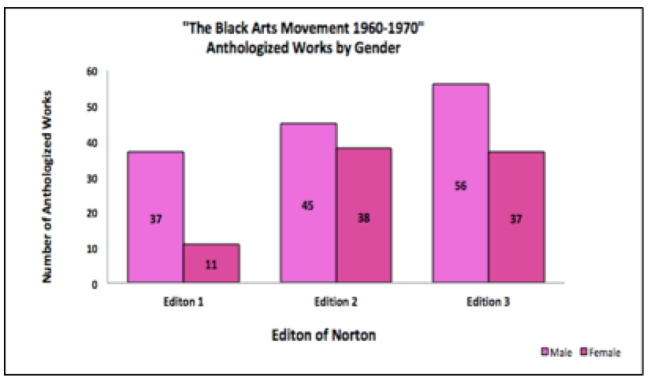 While the “Harlem Renaissance” and “Black Arts Movement” sections saw a disproportional representation of entries by men to women writers, the contemporary period saw a disproportional representation of women to men. The “Contemporary Period,” is the largest section of anthologized literary works across the three editions. 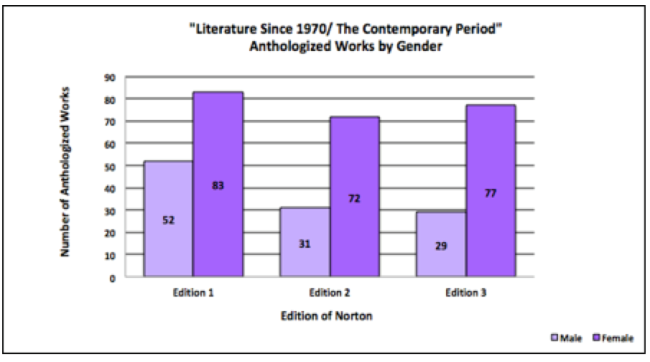 According to Figure 1.4, in each edition, anthologized works by women authors significantly outnumber the works included by men authors. Between 1997 and 2014, the number of works anthologized by women writers remains significantly higher than works anthologized by men. Entries by men writers decrease in “Contemporary Period” from 52 entries in the first edition, to 31 entries in the second edition, to 29 entries in the latest edition. What does this analysis suggest? A larger number of black women writers have received widespread critical attention over the last four decades than in previous eras. Toni Morrison and Alice Walker won Pulitzer Prizes for fiction. Rita Dove, Natasha Trethewey, and Tracy K. Smith won prizes for poetry. Morrison won the Nobel. Octavia Butler gained considerable attention for science fiction. The gender argument, alone, doesn't explain why these women got in and other women did not. My findings indicate the need for more research regarding the types of texts by black women writers that editors include.